I am currently a Senior in the DMS program about to graduate in 3 months and boy has it been an amazing journey! 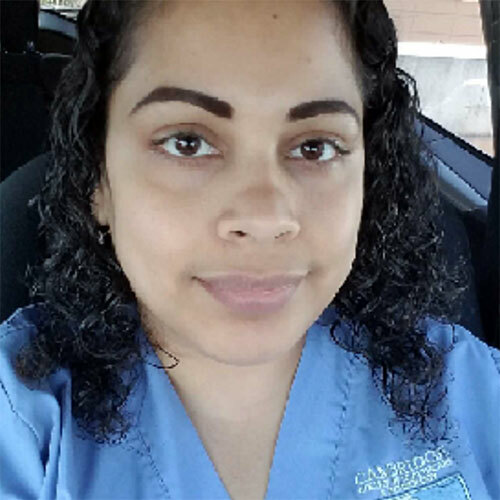 At the beginning, it was tough for me adjusting with work, family, and school, but Sonography was always something I wanted to do so I was determined to push myself through the struggles. I’ve had so much support from the school staff, teachers, clinical coordinators, family to my amazing class group of friends. We all help each other out! At Cambridge, there is a lot of on hands which is great! This prepares you for the real world when you start clinicals. “NEVER DENY THE PROBE” a statement I’ve lived by through my amazing clinical experiences. I was honored to have had Baptist Miami as my first rotation. I learned so much from them and left there completing exams on my own with minimal supervision. When you show interest, initiative, and motivation, you will leave each site as a potential job because they will want you back! I can’t wait to graduate and start working in the field and helping other students as they did for me!